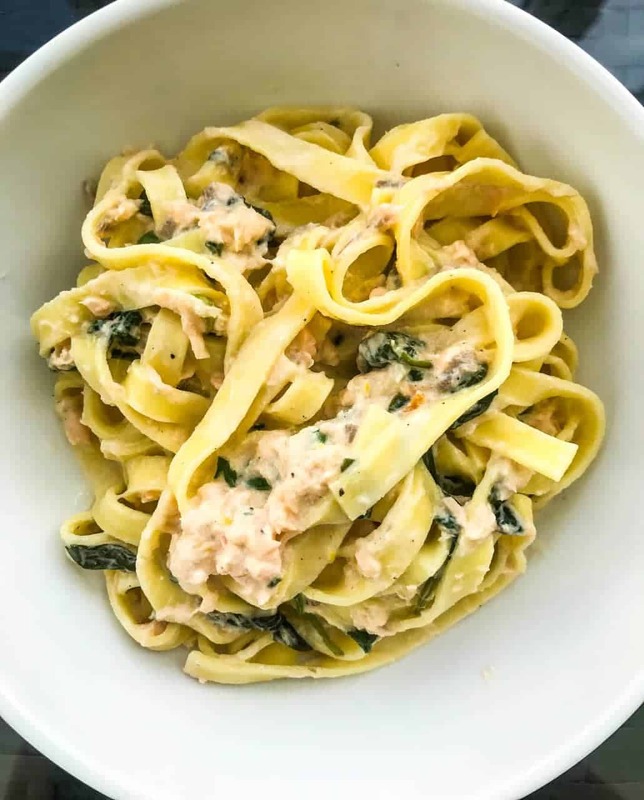 This quick & easy salmon spinach pasta with hot smoked salmon is one of my most trusted companions. It comes together in under 15 minutes, is really easy to make and leaves a minimal amount of dishes. Perfect for a weeknight, but tasty enough for the weekend as well! 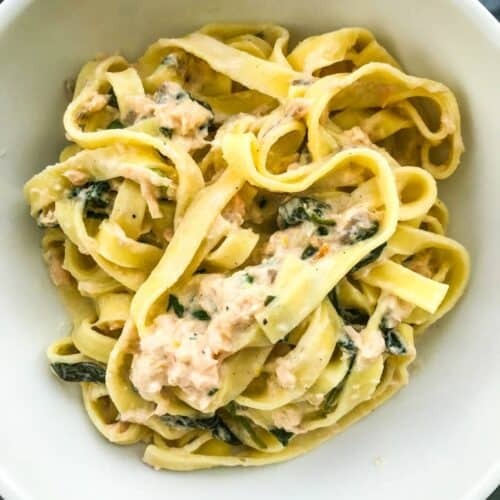 I’m not sure when I made salmon spinach pasta a part of my repertoire, but I seriously can’t remember a time when it wasn’t one of my go-to recipes. I do however vividly remember craving it every other day when living in Singapore & then again in Bangkok (the only two periods of my grown-up life when I haven’t been cooking at least every other day) – and it being one of the very first dishes I whipped up once I was back home again. 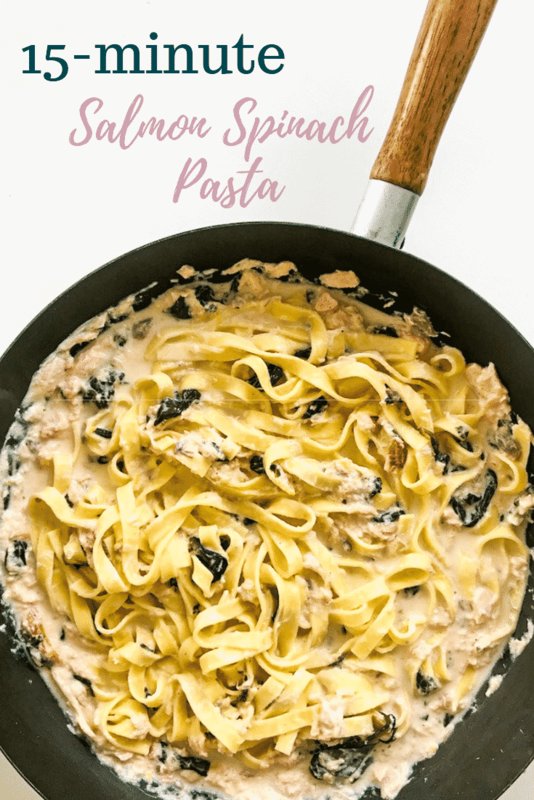 This salmon spinach pasta really is a classic in my book. Even if I’m a true lover of pasta I sometimes crave something that at least feels a bit lighter (confession: even I don’t crave something heavier like Red Wine Chicken Pasta every day!) – and the salmon, spinach and lemon in this recipe lighten it up in just the right way. As you might know by now, I love my lemon. So I add a lot. I want it to taste of lemon, not just have it back up the salmon and spinach. If you see lemon as more of a background character, that’s fine. Just use a bit less and it will still be seriously tasty. A big selling point of this salmon spinach pasta is that it’s so quick to throw together. I love cooking with ingredients that are already “finished” – like grilled chicken or here, smoked salmon. It makes the whole process so much quicker, easier and cleaner. Like seriously, this salmon spinach pasta will take you 15 minutes tops and leave little but a chopping board, knife and the pan for washing up. Perfect for a weeknight – but it truly is tasty enough for a weekend dinner party as well (I actually made this for one of my closest friends’ birthday lunch the other weekend). I promise, no one will know you took the easy route. And if you tell them, they’ll definitely ask for the recipe (just send them my way, okay?). 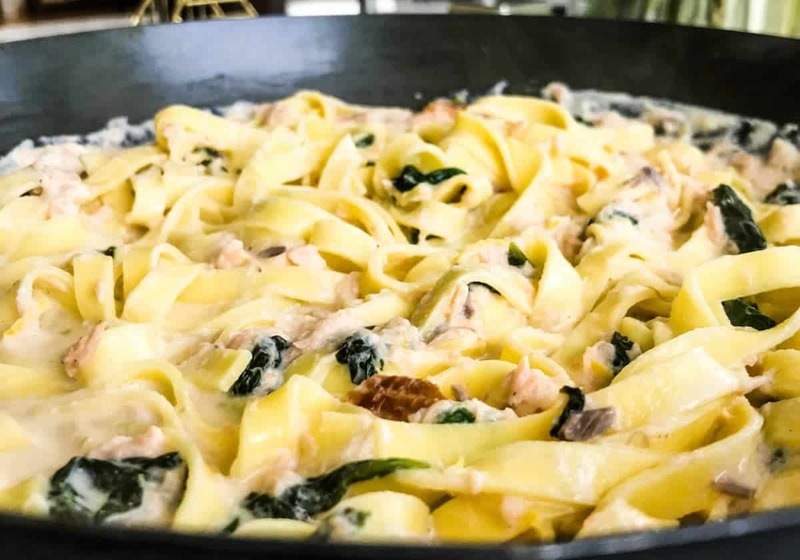 Speaking of weeknights – this salmon spinach pasta will heat up really well. I love to bring it along to work for lunch, or have it ready in the fridge for dinner. So yes, you could actually get almost all your weeknight lunches or dinners ready in 15 minutes maximum. How’s that for easy meal prepping?! Heat up the cream and creme fraiche in a pan large enough to hold all the sauce and pasta. Add the spinach and cook until it has decreased significantly in volume. Add lemon zest, lemon juice, salt and black pepper. Taste test and adjust seasoning accordingly. Let it cook for a few minutes. Start cooking the pasta - this recipe is a quick one! Then add the salmon to the sauce and let simmer for a minute. When the pasta is a minute from finished: add it to the sauce together with about 1 dl of pasta water. Give it a good mix and let it cook for 2 minutes. Done! Now enjoy.